Cybercrime, hactivism, cyber espionage: Today’s digital, global economy exposes organizations to a great number of cyber threats, risks and liabilities. Disruptions to business in the form of data breaches, hacking, website or social media account takeovers and IT infrastructure threats are part of the new business reality for organizations in any sector. This reality is further complicated by the fact that more than 80% of available information is composed of difficult to manage unstructured content from open sources such as web pages, the dark web, social media and blogs, whose volume expands exponentially on a daily basis. This makes the ability to analyze these datasets an essential, yet challenging requirement for enterprises to detect cyber threats and appropriately put preventive measures in place. Being able to protect your organization and information assets against today’s and tomorrow’s cyber threats requires a unique Artificial Intelligence cybersecurity software able to master AAA technologies – AI, Augmentation and Automation – to take advantage of an understanding of language, text and context to transform your ability to reveal risks and actual threats concealed in information: Cogito Intelligence Platform. 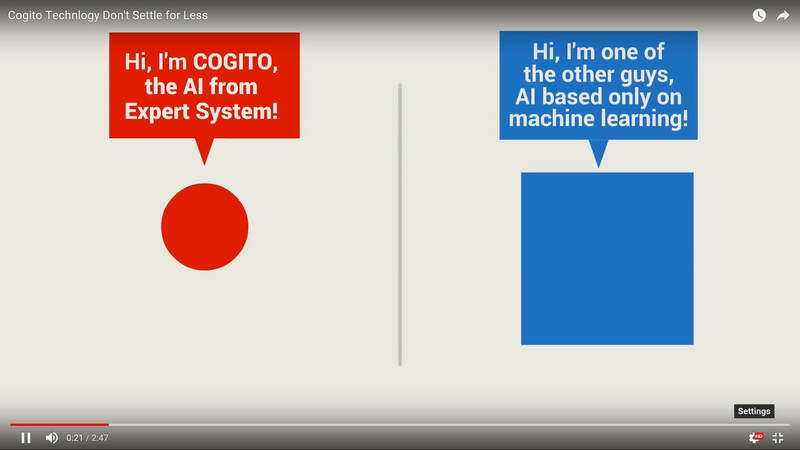 Cogito Intelligence Platform is able to master AAA technologies by using Artificial Intelligence features of Cogito to Augment the effectiveness of text analysis and Automate intelligence processes. Want to learn more about Cyber Threat Intelligence Platform? Request a Demo Right Now! The value of a cyber security software is its ability to make the processes of digital asset protection more efficient through the use of all of the information available and provide the tools that analysts need to gain visibility, context and insight from data and information. Most cyber threat intelligence tools convert input data into actionable information manually or with keyword-based alerting and search mechanisms. The Artificial Intelligence technology of Expert System brings cognitive capabilities to provide the right information at the right time in the proper context, using the right format. The surrounding context is relevant in analyzing unstructured data as well as the ability to support analysts during all phases of the intelligence cycle, from planning and direction to dissemination and feedback. The result is meaningful, actionable intelligence that enhances insight, fuels more knowledgeable decisions and strengthens what analytics can reveal. Want to learn more on Cogito Intelligence Platform? Download the brochure! Based on the cognitive Cogito technology, Cogito Intelligence Platform (CIP) is a cyber threat platform that analyzes millions of web pages and unstructured documents from a variety of sources to help companies mitigate cyber security threats. CIP discovers connections between different sources and provides multiple scenarios as data emerges, in multiple languages. Cogito Intelligence Platform is built to manage multiple sources and can analyze thousands of documents in a single click to identify possible cyber threats and provide valuable insight to assess digital asset security related risks. CIP includes a Corporate Liability Taxonomy and an automatic alerts feature to immediately identify critical events.